The Violin Shop: The Ahn Trio. Beauty & Talent. 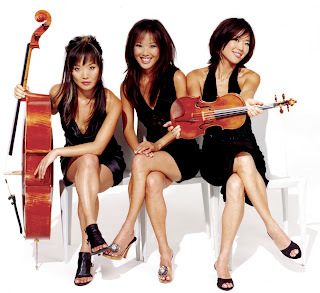 In 2008, the Ahn Trio released their latest album, "Lullaby for my Favorite Insomniac." It is a modern classical take on songs that, well, are lullabies for twenty-first century insomniacs. Creating this album, the sisters commissioned work from composers such as Kenji Bunch, Michael Nyman, Roberto Carnevale, and Ronn Yedidia. The Ahn Trio also used transposed works from Rodgers and Hart, Astor Piazzolla, David Bowie and Pat Metheny. There are also guest singers performing, and four bonus tracks of remixed songs with DJs such as Tao of Sound, DJ Spooky, Superdrive, and Ra. D.
Angella is the violinist in the trio. She was born in 1972 and also is the youngest of the group. Angella is a good friend and collaborator with violinist/composer Mark O'Connor. Mark runs the Mark O'Connor Fiddle Camp in the summers. 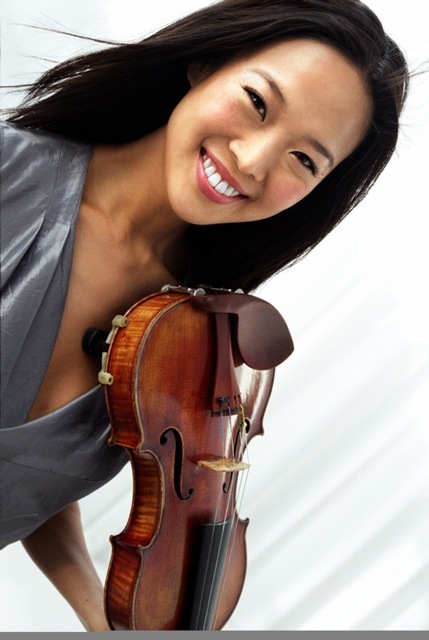 Angella also teaches violin and viola at Montana State University. Lucia Ahn in the pianist and the twin sister of Maria, born in 1970. When she was in kindergarten, she spotted a piano and begged her mom for lessons. A year after receiving her wish, her sisters were inspired to start their own instrument. She prefers playing on a Hamburg Steinway piano. Maria Ahn is the cellist. She is Lucia's twin, born in 1970. She enjoys finding new artists in airports (by buying CDs). She said she never dreamed of being in a "sister trio." But through her success, I bet she is grateful for the way things ended up. Angella Lucia and Maria not only sound beautiful, but look beautiful. They have posed for magazines Vogue, and GQ, they have been photographed by Arthur Elgort, Ellen von Unwerth, and Walter Chin. They have also posed for GAP, Anne Klein, and Body Shop. In 2003, all three were chosen to be in People Magazine's 50 Most Beautiful People. I find their take on music impressive as well as inspiring. The Ahn Trio has found a way to bring classical music to a different level. Their philosophy is that musical genres don't need to remain separated, but can collaborate together to activate new emotions in the soul. They have proved themselves as gifted musicians, recreating classical pieces and also twisting in modern and contemporary music of many genres. It gives classical pieces a new display that expresses deep emotions and connects audiences of all different kinds to appreciate the beauty of music.